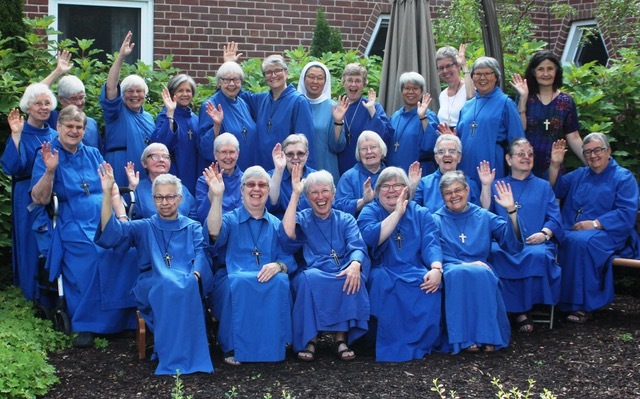 Born in Sudbury, Sr. Elizabeth Ann recalls “a happy city where multi-cultural people helped each other through hard times – a good place to grow up”. She was one of six children (but two brothers died in childhood). She now has two brothers and a sister. Her parents sponsored several children through Foster Parents Plan including one foster brother from Korea whom she met in the summer of 2012 when he came to visit Canada. At age 10 she moved to Toronto and connected with St. Matthew’s Islington. Then at age 16 she moved to North York and joined St. John’s York Mills. High School, mainly through the Alternate and Independent Studies Program, was followed by Forestry at Lakehead University while attending church in Port Arthur. Having had earlier involvement with church pageants, Sunday School, and Junior Auxiliary, she joined the choir, drama group and became a server. She began to explore Christian Meditation, reading The Cloud of Unknowing, The Philokalia, and going for a month’s visit to the Convent. “I was caught up in the silent pauses in the recitation of the psalms; the touch of God was in that silence”.